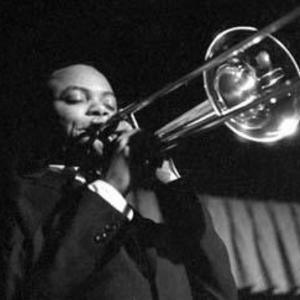 J. J. Johnson (born James Louis Johnson) in Indianapolis, Indiana, (January 22, 1924 - February 4, 2001), was an American jazz trombonist, composer and arranger. He recorded a number of popular albums with fellow trombonist Kai Winding, as well as many solo albums, and was a sideman on many classic jazz recordings. Several of his compositions, including "Wee Dot," "Lament," and "Enigma" are considered jazz standards. He recorded a number of popular albums with fellow trombonist Kai Winding, as well as many solo albums, and was a sideman on many classic jazz recordings. Several of his compositions, including "Wee Dot," "Lament," and "Enigma" are considered jazz standards. He was part of the Third Stream movement in jazz music in the late 1950s and early 1960s and wrote a number of large-scale works which incorporated elements of both classical and jazz music. In his early twenties he developed a remarkable, flawless technique and was the first trombonist to rise to the challenge of bebop music, remaining unchallenged at the forefront of modern jazz throughout his career. In 1970 he ceased performing in public for most of 17 years, before a comeback in the late 1980s. From the mid fifties on, he was a perennial polling favorite in jazz circles, even winning Down Beat's "Trombonist of the Year" during years he wasn't active. Voted into Down Beat's Hall of Fame in 1995, J. J. Johnson's recording career spanned 54 years, from 1942 to 1996. He has long been regarded as the greatest trombonist of the post-Swing Era, a pervasive influence on other jazz musicians, and one of jazz's legendary figures.